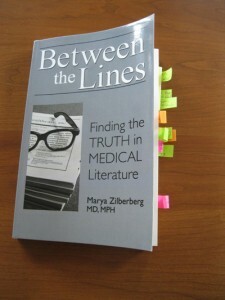 Early on in Between the Lines , a breezy new book on medical statistics by Dr. Marya Zilberberg, the author encourages her readers to “write, underline, highlight, dog-ear and leave sticky notes.” I did just that. Well, with one exception; I didn’t use a highlighter. That’s partially due to my fear of chemicals, but mainly because we had none in my home. I enjoyed reading this book, perhaps more than I’d anticipated. Maybe that’s because I find the subject of analyzing quantitative data, in itself, dull. But this proves an easy read: it’s short and not boring. The author avoids minutia. Although I’m wary of simplified approaches – because as she points out, the devil is often in the details of any study – this tact serves the reader who might otherwise drop off this topic. Her style is informal. 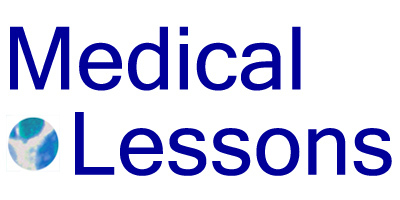 The examples she chooses to illustrate points on medical studies are relevant to what you might find in a current journal or newspaper this morning. Over the past year or two, I have gotten to know Dr. Zilberberg, just a bit, as a blogging colleague and on-line associate. This book gave me the chance to understand her perspective. Now, I can better “see” where she’s coming from. There’s a lot anyone with an early high school math background, or a much higher level of education, might take away from this work. For doctors who’ve attended four-year med schools and, of course, know their stats well (I’m joking, TBC*), this book provides an eminently readable review of basic concepts – sensitivity, specificity, types of evidence, types of trials, Type II errors, etc. For those, perhaps pharmacy student, journalists and others, looking for an accessible source of information on terms like “accuracy” or HTE (heterogeneous treatment effect), Between the Lines will fill you in. The work reads as a skinny, statistical guidebook with commentary. It includes a few handy tables – on false positives and false negatives (Chapter 3), types of medical studies (Chapter 14), and relative risk (Chapter 19). There’s considered discussion of bias, sources of bias, hypothesis testing and observational studies. In the third chapter the author uses lung cancer screening scenarios to effectively explain terms like accuracy, sensitivity and specificity in diagnostic testing, and the concept of positive predictive value. Mammography is, not surprisingly, one of few areas about which I’d take issue with some of the author’s statements. For purposes of this post and mini-review, I’ll leave it at that, because I think this is a helpful book overall and in many particulars. This book sets the stage for richer, future discussions of clinical trials, cancer screening, evidence-based medicine, informed consent and more. It’s a contribution that can help move these dialogues forward. I look ahead to a continued, lasting and valuable conversation.